Birrell, Starrett, Morley, But Who is O.M? "O.M. stands for "Old Mandarin" or "Old Man." 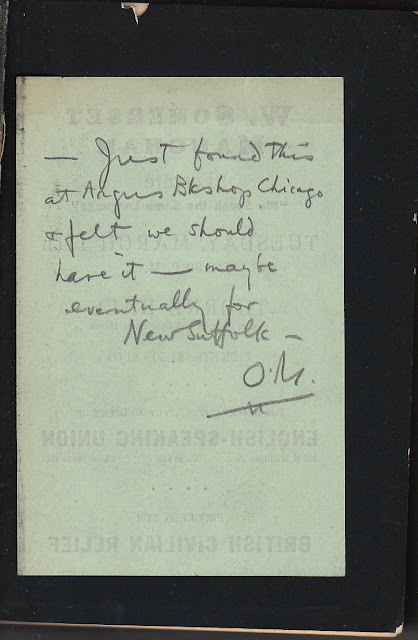 The inscription is from Christopher Morley to his son CM, Jr. "New Suffolk" was a house Morley had bought for war refugees on Long Island and stocked with English prints and books." There was a British Civilian Relief Fund during WWI. And March 11 fell on a Tuesday in 1919. But Thorne Hall was not constructed until 1925. There was a British Relief Fund during WWII as well. At the outbreak of WWII, the British Government asked Somerset Maugham to appeal for US. aid to Great Britain. 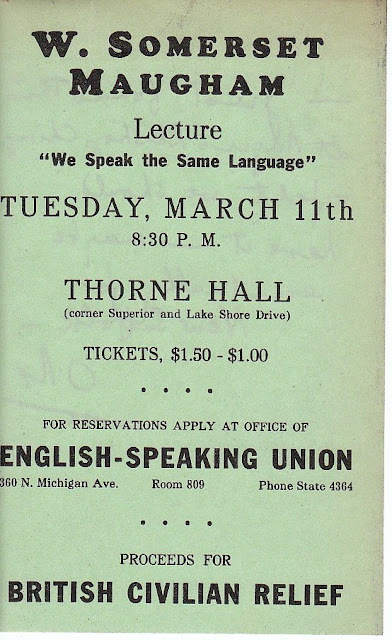 In 1941, March 11 fell on a Tuesday. Morley wrote his note in 1941. 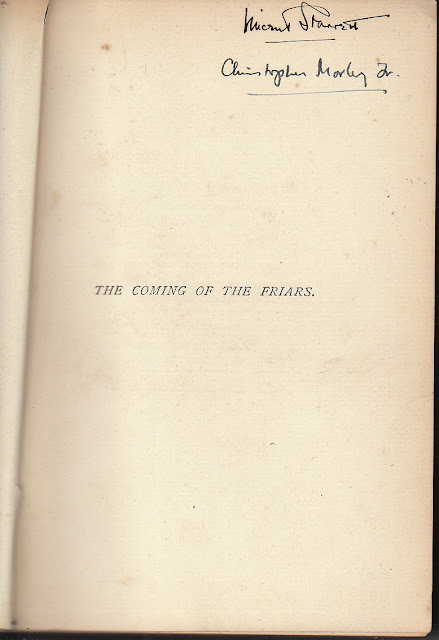 The title of the book itself is The Coming of the Friars And Other Essays by the Rev. Augustus Jessopp. 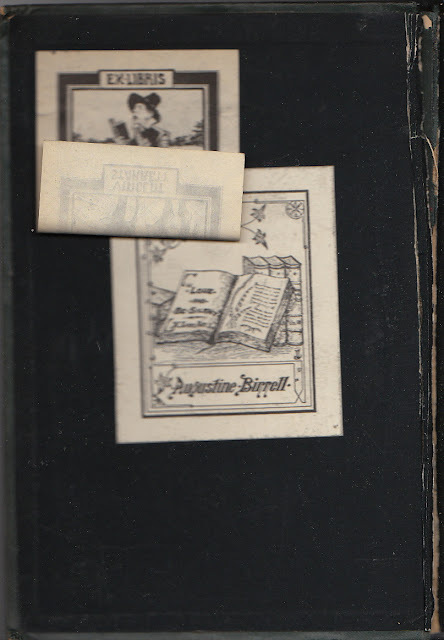 The book was published by T. Fisher Unwin in 1889. Unwin was the founder of the Johnson Club, of which Birrell was a member. 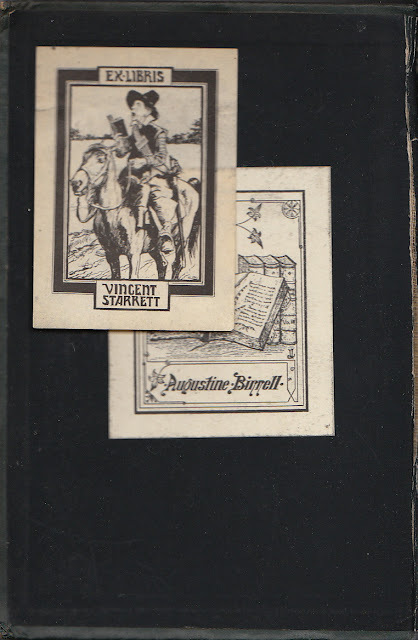 Birrell was an acquaintance of Jessopp as well. Both of them contributed articles to the periodicals of the day. I acquired the book from All Books Inc., Chattanooga, Tn.